Give this move a test drive to build pillar-sized legs. Are you tired of doing 4 sets of 12 reps in the squat? Are you getting bored with the same old routine week after week? Are you trying to build tree trunk legs with devastating power to boot? If you answered yes to these questions, try a squat variation that can break the monotony of your accumulation/volume phase. Farmer’s squats are an exercise I have been using for years for both myself and my athletes. Admittedly, I did not invent the farmer’s squats, they were first introduced to me by my coach/mentor John Amneus as a way to add variety during the preseason accumulation phase. To me, and I think I am not alone on this, volume work is extremely boring. But, as the men in the lab coats tell us, it is something that must be done so that you have a strong “base” for strength and power work later on in the year. This is where farmer’s squats come in. To perform a farmer’s squat you need a bar, some weights, and 10 meters of open space. Put the loaded bar (50% of squat max.) on your back in a back squat position. Walk 10 meters with the bar on your back and turn around. Do 10 reps of back squats. Walk 10 meters back to starting location and turn around. That’s all there is to it. Sounds easy, doesn’t it? The execution of the exercise is not complicated, just walking back and forth and squatting, but it's one of the biggest “gut check” exercises you can ever do. It takes a level of testicular fortitude that a lot of people just don’t have. Farmer’s squats are a great way to build a strong back and core, and activate the all-important posterior chain. Just think of all the little stabilizer muscles being used to hold the weight up for 40 meters and 30 reps of squats! Another benefit of doing farmers squats is the immense time under tension (TUT) involved in completing this exercise. This extreme amount of TUT is a great way to build muscular endurance, which will come in handy later in your macrocycle. Physical benefits aside, farmer’s squats are a great way to teach mental toughness and how to push your body to the limit without giving up. This mental benefit cannot be understated. It can be the difference between success and failure on the platform or the field. Mental toughness is a very important aspect of any sport, and unlike your genetic potential, it is something that you have complete control over. Every time you do something difficult and push your limits in the gym you are improving your mental game. 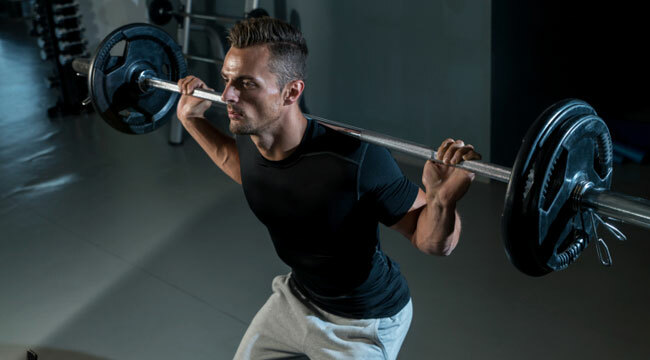 Farmer’s squats are a great tool to have in your training toolbox, but, because of the extreme fatigue induced, they should be used sparingly. They should be used as a changeup to your normal leg routine during the accumulation phase. At most they should be used once every 6-8 weeks or so. The weight is obviously very light, in the 50% range, but it will differ from athlete to athlete based on individual conditioning levels, mental toughness, etc. If you looking for an exercise that will test the upper limits of your mental toughness and provide some serious muscular endurance try out the Farmers Squat.